College: Michigan State University, Captain (2 years), All Conference (4 years), Conference Player of the Year, Received invitation to try out for US National Field Team (1998). 8 year Head Coach – Philadelphia Wings, Minnesota Swarm, NY Titans – only Head coach in NLL History to lead 3 teams to playoffs; NLL Coach of the Year in 2008 with NY Titans. 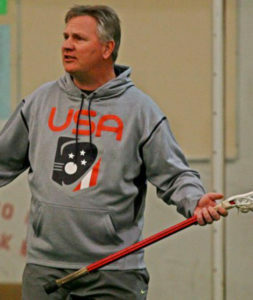 Coached and developed more American born field players than any other NLL coach. Developed instructional model for all ages of development for youth lacrosse organizations. Led Avon Grove Youth to first CCLA Championship. Coached age groups from U-7 through pro level at the town, club and regional levels including Avon Grove Youth, Penn Star, Philly Fever, Old School Lacrosse and Mesa Fresh. Developed off season skill sessions curriculums that trains players in both Canadian Box and American field skills to play faster and more efficiently each time they step on the field. Trains players in box/field hybrid team systems needed at the college level.